We have released new Product Designer tool in 2017. This article is written for online store owners or owners-to-be selling clothes, bags, shoes, mugs, even skateboards and other goods, who want to add a creative spark to their business and beat the competitors. 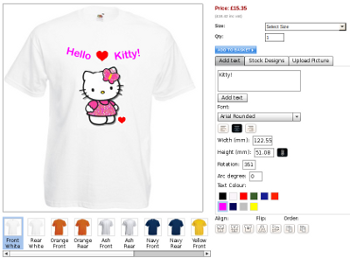 Why not add extra functionality to the online store by installing a T-shirt design tool that will allow customers to create their own product design? Seems to be a good idea. Let's see what is behind it and what kind of T-shirt design tools are available on the market. Upload an image or clipart from PC. Administrator can upload fonts, colors, cliparts. Such modules are of great interest for people who have already a shopping cart system or who consider buying one and looks for a T-shirt designer module. Here is a brief but informative overview for you. Please, note all mentioned prices are valid for the beginning of the 2012 year and subject to change. Alt-team, dedicated to CS-Cart shopping cart modules development, offers a Flash Product designer add-on for CS-Cart system. This module has a good advantage in comparison with others - four available modes: T-shirt designer mode, Sticker designer mode, Engraving designer mode and Fixed mode for customizing products with fixed text or image position such as postcards, business cards, calendars, etc. Apart from standard functionality Alt-team Product designer add-on has all necessary features for products customization such as multiple sides design (front, back, on a hood, on a sleeve, etc), text alignment, order, flip, arc, rotation tools. An administrator can set a cost per character or per line for the text fields and set a cost per square centimeter or per size for a customer's photo. You can get Product designer add-on for CS-Cart system at affordable price $250, installation is free. Advance Web Soft offers various modules for osCommerce shopping cart system among which a Flash-based T-shirt Customizer for osCommerce. It's a quite simple good-looking module, a fast-loading one with a limited set of features. T-shirt Customizer only allows you to add text or image, you can choose a front or back side of the product for personalization. Price is 99 Euro and 40 Euro for the installation. wePrint Design Studio offers their wePrint Design Studio module based on ImageMagick technology which can be installed to ZenCart and CS-Cart. Besides a standard functionality, wePrint Design Studio module has useful tools to work with text such as text alignment, rotation tool, it has the text outline feature, search for designs feature, etc. wePrint Design Studio module allows to create transparent .png for printing. An administrator can set per color pricing. The price is affordable enough $300 including one year of upgrades, installation is not free, $75 required. Configurateur Visual is dedicated to the development of Prestashop modules. They offer Configurateurvisuel design tool for Prestashop. There are several versions available. Version complete 'Full Edition': add text, add library images and upload images. Prices start from 449 Euro+ Prestashop users can choose a suitable version for their needs but Configurateurvisuel is a rather simple tool, for example, it doesn't suppose any extra features for text editing. Such modules are more expensive because they are aimed to be installed in any shopping cart a client has. No Refresh company offers various design tools such as T-shirt designer, Skins designer, Sticker designer, Greeting card designer, etc. which they can integrate in any open source technology and shopping cart (Magento, Prestashop, Zen cart, Virtuemart). You need to contact No Refresh team directly to learn prices. Their flash-based T-shirt design tool functionality is limited to a standard set of features and some extra possibilities such as text alignment tool, flip/flop tool, rotate clipart/image/text option. There are just few preloaded fonts, clipars, and colors, so it's up to the administrator to add more. As it is stated on the site, Online-Product-Designer has a positive experience in integrating their Online product designer software with os Commerce, Zen Cart, Joomla, Magento, X-cart and are ready to integrate their modules in any existing eCommerce system which supports third-party plugins. T-shirt designer Ver-1.0 with standard functionality plus a rich predefined gallery of cliparts, scale/rotate/flip functions, you can manipulate with layers. Advanced Tshirt Designer Ver-2.0 has such advanced features as “get a price for the product” feature, Shadow option (you can specify shadow angle, shadow distance), Text effects (different versions of distortion of text), etc. The company also offers more tools: Sign designer, Banner designer, Button designer, etc. To get information about prices you need to contact them directly, they have an individual approach and the price will depend on your preferences, what features you actually need and to what system you need to install the tool. LiveArt designer application by Develop Flash can be integrated into existing website or e-commerce platform. Once you send a feedback to the company, they investigate the possibility of integration and choose the best approach to enforce your website or e-commerce platform with the online design opportunities. LiveArt application is featured enough with instant preview of the product and design, various text effects (italic, bold, text alignment, shadow and shadow color, arc up, arc down, circle, roof up, roof down, bridge, valley, bulge, pinch, wave), rotate image and scale it across the printable area, etc. LiveArt provides just a few preloaded fonts or cliparts. It's up for administrator to add more. Let me finish my post here. Hope, this article will help you to choose a tool which suits your needs and budget best of all. "That's a nicely made awsner to a challenging question"